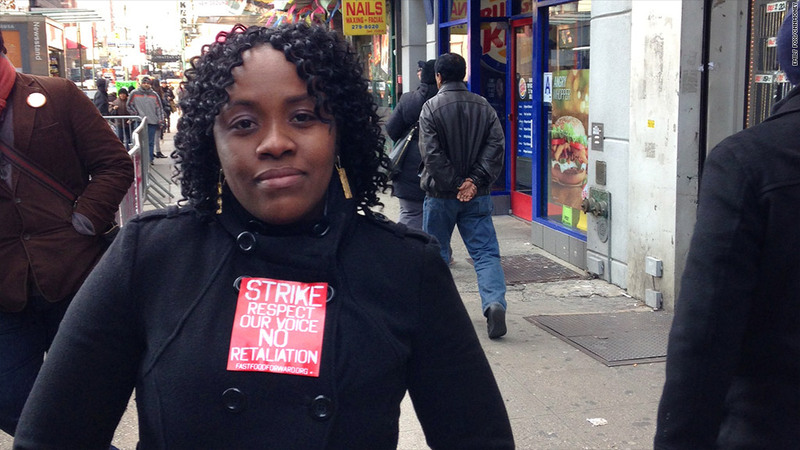 Pamela Waldron, who has worked at a New York City KFC for 8 years, joined dozens of other fast food workers protesting for higher pay and the right to form a union outside of a Burger King Thursday. Pamela Waldron makes $7.75 an hour as a cashier at the KFC in New York's Penn Station, where she has worked for eight years. That's just 50 cents above the New York state minimum wage. The 26-year old nursing student, and mother of two, says she has asked for a raise but her pleas have gone unheeded for weeks. Finally, on Thursday, around lunchtime she joined a protest of about 40 fast food workers who walked out of their shifts, carrying placards and shouting slogans to bring attention to their cause of fighting for higher wages and the right to unionize. The protest was held outside a Burger King (BKW) near Penn Station. "We're the ones who run the store day in and day out, and it's not easy," said Waldron. Earlier, Thursday morning, 14 workers from a midtown Manhattan McDonald's (MCD) location also walked out of their shifts in protest, according to a community organization New York Communities for Change. The group said it had organized several protests at different locations in the city, including Times Square and the Fulton Street Mall in Brooklyn. Workers from McDonald's, Burger King, and Yum Brand (YUM)-run restaurants KFC and Taco Bell are expected to join. Workers say they are asking for a pay raise to $15 an hour and the right to form a union. Currently, the median pay for the nearly 50,000 fast food workers in New York City is $9 an hour, or $18,500 a year, according to the New York Labor Department. That's about $4,500 lower than Census Bureau's poverty income threshold level of $23,000 for a family of four. KFC worker Waldron says she would be homeless with her kids if it were not for her husband's union-represented job at the grocery store chain Pathmark. Under the National Labor Relations Act, workers are protected from retaliation as long as they work in concert with at least one other employee to try to change their working conditions. However, they can be "permanently replaced" if they strike for purely economic reasons, according to Ken Margolies, a senior associate at the Worker Institute at Cornell University. "The workers who strike are taking a significant risk that takes a lot of courage," Margolies said. Raymond Lopez, a 21-year old shift manager at the midtown Manhattan McDonald's, was one of the workers protesting Thursday morning. Lopez makes $8.75 an hour, after working at the hamburger joint for two years. Despite a 40-hour work week, Lopez works two more jobs to supplement his income, a part-time job at a condominium and at a caterer to pay his bills and his $500 student loan payments each month. "I wouldn't be able to survive just working at McDonald's," he said. According to Jonathon Westin, the organizing director for New York Communities for Change, workers like Lopez can't afford rent or to put food on the table with their meager wages. "Many of these workers have to rely on government assistance because they're being paid poverty wages," he said. The New York Communities for Change is supported by several unions, including UnitedNY, the Black Institute and the Service Employees International Union. Together the unions represent employees at grocery stores, government, hospitals, and also African American workers. McDonald's said in a statement that the chain has an open dialogue with its employees and welcomes them to express concerns. "McDonald's values our employees and has consistently remained committed to them, so in turn they can provide quality service to our customers," the fast food retailer said. 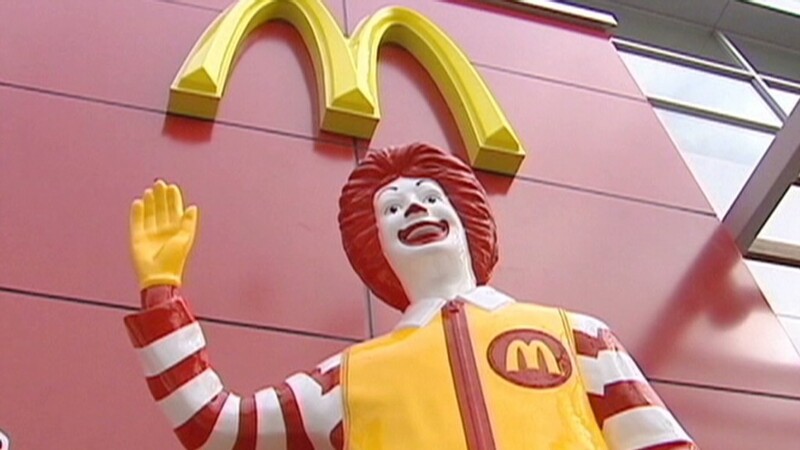 The statement added that the majority of McDonald's restaurants are owned and operated by independent business people. Rick Cisneros, the owner of the midtown McDonald's franchise location, said in a statement that he always encourages employees to provide feedback so that he can be an even better employer. Organizers of the protests say that workers are planning to go back to work tomorrow. Labor experts say there have been scattered attempts to organize over the last several decades, but very little in the fast food industry has stuck. Many say that's because there is a high labor turnover rate in the industry. According to Cornell University's Margolies, unions haven't been able to get enough workers to organize an election to form a union. Workers at Starbucks (SBUX) and sandwich store Jimmy Johns made some headway, but those efforts didn't go anywhere. Margolies said this is part of a larger movement of low wage workers to improve their economic positions and treatment on the job. Last week, hundreds of Wal-Mart workers protested on Black Friday against retaliation after speaking out for higher pay, fair hours and more affordable health care.